With everyone around posting their best springtime recipes, I couldn't resist jumping on the bandwagon. Though I still have plenty of canned and frozen food in the house, something was calling me to the produce section of the grocery store, I place I've scarcely been all winter. And there.... there I beheld the minimal cupola, the scallop of scales and pomegranate burnishes. Oh, I'm a sucker for a good metaphor. Into the bag they went, a jumble of green points and smooth petals. California produce in April is a heady siren song, an irresistable temptress. It's easy enough for me to resist the wilted bagged lettuces of January, and those hard red pellets people euphemistically call "grape tomatoes." But this time of year, when sassy, charismatic vegetables return to upstate New York, they seem glamorous as movie stars to my green-starved eyes. One day, there's the same old sorry sacks of potatoes, greenish grapefruits and paint-ball quality tomatoes... and the next there's tumbling piles of gleaming chard, glossy rolling-pin sized leeks, fecund asparagus, and sweet little bundles of pink radishes. For a die-hard foodie like me, it's paradise. This recipe is one I bamboozled from my favorite, Moosewood Celebrates. Though it calls for both boiling and roasting the artichokes, I guarantee, it will not let you down. Begin bringing a big pot of water to a boil. Seizing an artichoke in one hand and a stainless steel knife in the other, slice off the top quarter of the scales. I found my serrated bread knife worked best-- those scales are tough! Next, pull off the outer scales one by one, until you get down to the yellow ones. Trim the stem so the artichoke will sit upright on a flat surface. Repeat with the rest. Preheat your oven to 450 degrees. Whisk the remaining ingredients together in a small bowl. Boil your trimmed artichokes for 10-20 minutes, and drain upside down. Arrange them upright in a shallow glass baking dish (or pie plate, if you're me) and drizzle the dressing over them. Slide into the oven, and roast for 20 minutes, basting occasionally to keep the hearts from drying out. 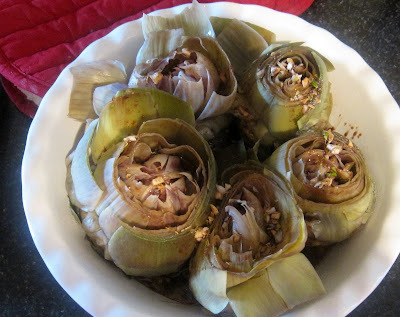 If your artichokes were petite and tender, you may well be able to eat them whole upon their emergence from your oven. If, by contrast, your artichokes rivaled the size of softballs, then the way to eat them is by pulling the scales off one by one, and scraping the soft side along your bottom teeth as you pull it out of your mouth. Pablo Neruda (later in the poem) called this stuff "halcyon paste." I just call it delicious. Note: We made a meal out of our artichokes by making them the centerpiece of a big salad with some good bread on the side. And plenty of feta sprinkled over the top. Bonanza! Next winter, when I again have an insane amount of potatoes in my cellar, I'll know what to do! I love artichokes and always pause - thinking - man that's a lot of work to get to the good part. Maybe if I can find some small enough - your recipe sounds so very good. Too funny! You're kind of a food poet. A new genre in the making? Claudia-- they are indeed a rather high-maintenance vegetable. I enjoy the prepwork, though. It makes me feel connected, to work with a pile of vegetables like that. Almost like meditation. Does that sound crazy? Christy-- I've been called lots of things before, but Food Poet was not one of them. Until now! Good stuff, it's hard to find good articles on how to make stuff like that. You should try posting this on Wacanai.com ( http://www.wacanai.com/intro ). I find most of my stuff there. It's nice because you can search by ingredients and by the name of the finished product. You can link your page to the website and it helps you keep track of who is using your articles. Great list of drink recipes for parties too!